Agylix says it doesn’t need to pre-clean its trash much. In recycling, that helps. It’s like a mix of Sanford and Son and The Beverly Hillbillies. A key component of any plastic is petroleum, so it makes sense that plastics can later be recycled into fuel. With 8 percent of the U.S. fuel supply going into plastics, there’s a vast opportunity for technologies that can convert used plastics back into petroleum. However, the process gets a bit tricky when products contain multiple plastics, or are contaminated by dirt, glass, metal or food. “It’s extremely difficult to recycle mixed plastics into crude oil,” said Chris Ulum, CEO of Agilyx at the Cleantech Forum in San Francisco today. Ulum revealed today that Agilyx has just closed its $22 million Series B led by Kleiner Perkins. In all, the company has raised $28.7 million from investors including Total, WM Inc., Saffron Hill Ventures and Chrysalix Energy Venture Capital. Agilyx claims to have unique technology to convert commingled and dirty plastics into crude oil that can be pumped directly into existing refineries. Agilyx’s oil isn’t subject to the fluctuations that have seen the price of a barrel rise to about $100 in recent weeks -- plus, it’s cheaper. Ulum says Agilyx’s fuel is competitive with crude oil at $65 to $70 a barrel. Recycling has been picking up all year, but the price of oil should give the movement momentum. MCR produces nylon from old carpet that is cheaper than new nylon: the run from its prototype factory is sold out. Lehigh Technologies, which has refashioned drug disposal equipment to make recycled rubber, can sell refurbished rubber for less than new at $80-a-barrel oil prices. Waste Management, the GE of garbage, is working with Genomatica on microbes for landfills. Many recycling companies, however, need to clean their feedstocks pretty well before they can be reused. Plastic "recycling" is also often a metaphor these days. 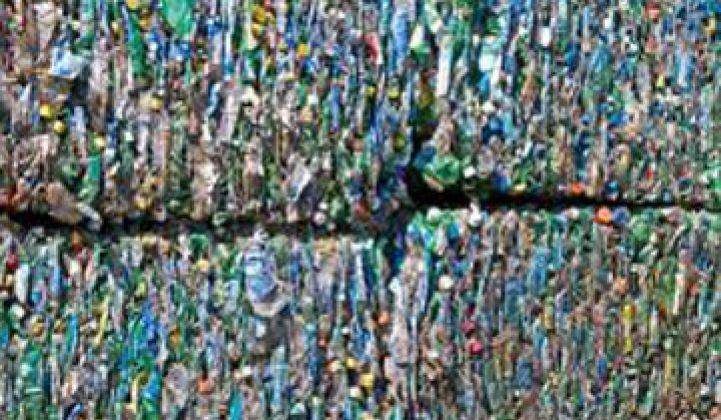 In many places, plastic gets burned in incinerators for heat, making it a very dirty form of energy; in many cases, the plastic gets sent to landfills in Asia, says Bioplastech, which recycles plastic into plastic via microbes. Part of the value proposition is a first-mover advantage. Agilyx says it’s the only company with this technology to be permitted to operate in the United States; plus, it has inked a five-year contract for U.S. Oil & Refining to buy the fuel produced using its technology. Oregon-based Agilyx has a two-part business model. Its current focus is financing, deploying, operating and maintaining its systems on customer sites, which are typically co-located with waste and recycling companies. The company also plans to sell the technology to customers, while taking royalties from the sale of fuel. The company is projecting $15 million in revenue this year. The minimum load for Agilyx’s systems to be cost-competitive with crude oil is 10 tons of mixed plastic a day, but the modular systems can easily be scaled. Ulum says Agilyx’s production cost for a barrel of its bio-based solution is $52, and he expects to lower costs to the high $30s to low $40s without any government incentives.